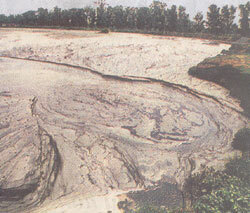 A fly ash pond on the banks of the Yamuna. Fly ash, a residue of coal used for generating power at Delhi's Rajghat and Inderprastha plants, finds its way into the river when it is in spate. This photo by Harish Tyagi appeared in theTimes of India dated June 7, 2001. In the 1970s the Yamuna had a bird life as colourful as the Bharatpur bird sanctuary. 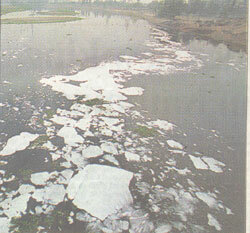 Untreated effluents pour into the Western Yamuna canal from a Yamunanagar factory; the industrial belt. Ammonia, the largest pollutant, is being released by sugar factories, paper mills and distilleries. 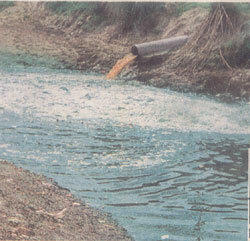 Pulping and bleaching in paper mills requires large amounts of chlorine which mixes with other chemicals to form dioxins and furans. The stretch of Yamuna near the Wazirabad Water treatment plant takes in flowers, ashes, idols and other puja materials wrapped in plastics. This photo by an unknown photographer appeared in theTimes of India after the 2003 Dusshera festival. 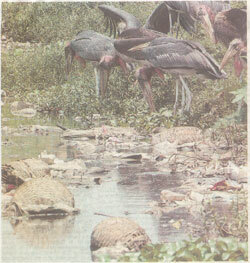 A group of Greater Adjutant storks look for food in a polluted wetland area in Guwahati. Lack of proper garbage dumping facilities in the city is endangering the environment as well as wildlife. 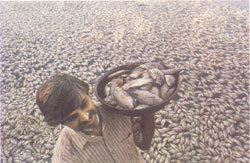 Dead fish at the Kankaria lake in Ahmedabad. This photo by AP appeared inThe Hindu dated October 13, 2004. The mass death has been blamed on chemical pollution caused by the immersion of idols made of synthetic materials and coated with chemical dyes.